Bats are very small and quiet animals, rather unassuming and almost invisible. Nocturnal animals, as well as shy ones, it's rare for bats to make a specific beeline for the living areas of your home. Usually, the bats will have moved into the attic -- preferring the upper levels of the building -- before accidentally getting into wall cavities or other places that then lead right into where you and your family live. 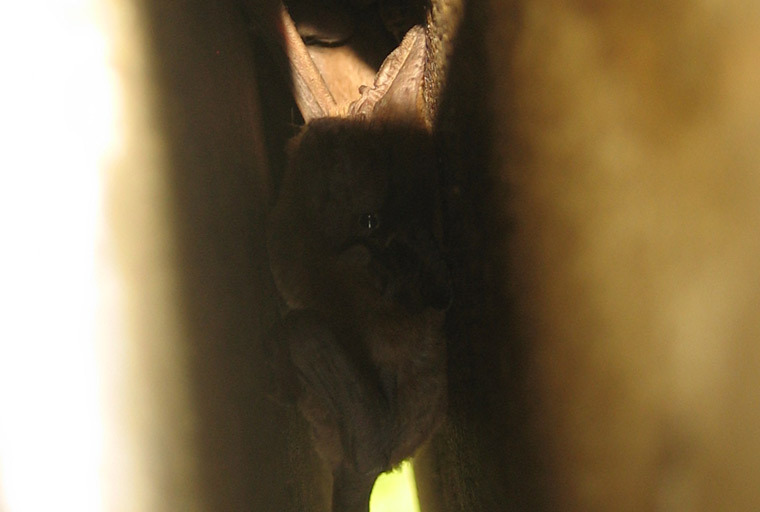 Bats in walls and wall cavities are common when attic infestations have not been dealt with quickly enough, or if the building isn't well-maintained/has fallen into disrepair. Getting them out won't be easy, though. To make things worse, you can't remove bats during the spring or summer – May through September. You will also need to look up or ask about the legalities of moving or evicting bats for your area or state. All of these things are marketed or advised to get rid of bats. Ammonia gives off toxic gases which will probably kill bats, and might even kill off a few of your family members too if you're not careful using it. Killing them off is a tad dramatically, admittedly, but you might still make them quite sick, and also yourself in the process. Turning on the lights can work. It probably won't work all by itself, but as an approach to gently encourage them to leave, it might just work. Bats are nocturnal and they don't like bright lights. If you have bats in the attic, head on up there and turn the lights on – they'll scatter and leave fast. They'll come back, though. That's the problem. Turning on the lights CAN work if you use sealing methods to back them up. If you turn the lights on – beam torchlight into the wall cavity, looking down from the attic – the bats will probably leave. Once you're sure they've all gone, it's sealing time. Make sure they can't get back in there, and that they can't get back into the attic either. We don't actually recommend that you try to retrieve the bats yourself. Snare poles are just going to injure the animal and you'll probably face legal action for that. Using a fishing net or similar might also seem smart, but you will panic the bat, causing it to fly around in the net, potentially injuring itself or getting caught up. Plus, when you have the bat in the net you then need to release it. These tiny creatures come with a big risk on their shoulders – rabies. One bite is all it takes. One bite that you might not even feel because bat teeth are so small. This is the path that we recommend, but we're meant to say that. The laws surrounding the removal or eviction of bats are confusing to say the least. A professional will understand them, will know how to and how not to deal with the bat-in-the-wall situation, and will have all the necessary knowledge and tools to get them out, seal the wall up, and then prevent the bat infestation from coming back. They'll ever perform a cleanup operation, which is a serious little operation all by itself. This is the final step for many, and might even be the step that your bat removal specialist will need to take. If the bat can't be accessed from the top, looking down into the wall cavity from the attic, the only other way to get the bat or bats out of the wall is to physically cut out and remove a section of that wall. Obviously, you're going to want to know FOR CERTAIN where the bats are hiding, but your senses will give you a hand. You might hear them, especially at night. You might smell them. If you hold your hand to the wall, you might even be able to feel some heat from them too. Walk around room looking like a little bit of a lunatic, listening to some parts of it, feeling others, thumping here and there. Be ALMOST sure that you have found the spot, before hearing a noise coming from the opposite side of the room and repeating the process again. Grab your best power tools, beg your significant other to forgive you, and then physically cut like you've never cut before … in the most neat, precise, and small-scale way that you can. Hopefully, you'll get the spot right and find bats behind the wall. You can proceed to the next step. If you haven't found bats in the wall, go back to step one and repeat. Hope bats leave the space. Shine a light into the space. Play music in the room. Bang some saucepans together. Grab thick gloves if the bats don't leave. Try to grab bats, one by one, throwing them out the back door and hoping for the best each time. Remove roost and guano, wearing eye protection, a breathing mask, and coveralls. Make sure all biological matter has been washed away with strong, biological cleaners. Seal hole if possible. Replace/fix cut-out section of wall. Repaint or re-wallpaper. Show off your handiwork to your significant other. Head up to the attic to start the process all over again. It's understandable why the professionals get paid to do just that job, right? It's a LONG process! Go back to the Bat Removal page, or learn about bats in the attic with my Bats in the Attic guide.